The Booth welcomes guest poster Heather, author of the blog The Parsimonious Princess. I love gardening. I love the inherent miracle of it. I love getting dirt under my fingernails. My heart thrills seeing plants grow. I love the planning, the planting, the watering. Heck, I don't even mind weeding all that much. I'm fascinated by my compost pile and I fantasize over tiny green tomatoes. Oh, the possibilities that come with growing a garden! But there was always one aspect of gardening that I felt I was missing out on. I'd never started seeds indoors. Sure, I planted some seeds outside in the early spring -- peas, spinach, kale, Swiss chard, carrots, pretty much all the cold-hardy ones. However, I'd always relied heavily on transplants from the local nursery when it came to tender vegetables like tomatoes. Not only did I feel like I wasn't a full-fledged gardener, but I also felt a little ashamed that I was spending as much as I was on my garden. When I took a step back and considered the money put in and the produce coming out of my garden, I wasn't really saving that much money by gardening. There have been a couple seasons where my gardens were pretty disappointing and I barely broke even (last season, I think I may have even lost money). 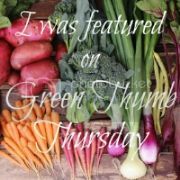 Gardening is a great way to save money and a great way to be self-reliant; however, it wasn't saving me the money I wanted it to and I didn't feel so self-reliant depending on transplants from the garden center at Home Depot. But seed starting seemed so daunting, what with all the fluorescent lighting and seed trays. I couldn't think of a spot in my basement-less, 1500-square-foot house to devote to a seed starting operation. Maybe someday I would be able to buy organic seeds and grow heirloom tomatoes from scratch, but I figured it'd have to wait until I had a bigger home. Then, in the beginning of this year, when I was in the midst of my garden planning and book reading (it's basically how I make it through the cold, muddy-snowy months of February and March), I came across a completely new way to start seeds: mini greenhouses made from empty milk jugs. I started collecting them that day. 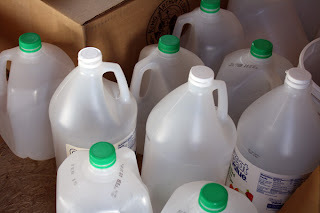 I washed out and saved more gallon-size milk and vinegar (we go through A LOT of vinegar at our house) jugs than I needed. Like I said, I was pretty excited about this new gardening experiment. 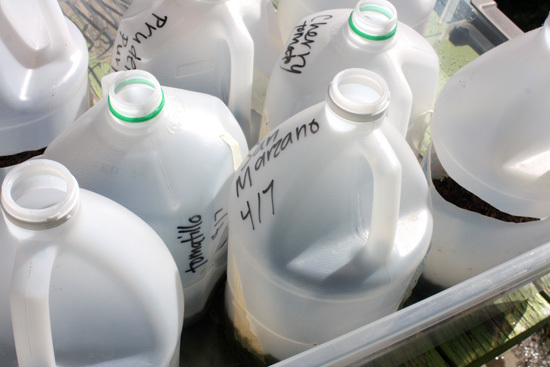 To make the mini-greenhouses, you simply need clean and empty gallon-sized jugs, something to cut them with (I used my husband's pocket knife), a drill, duct tape, a permanent marker, potting soil, and seeds. Cut the empty milk jug almost in half (you want to leave part of it connected so it stays together -- the uncut part works like a hinge). Drill 15 holes in the bottom and a couple on each side (about an inch from the base) -- this allows for proper drainage and ventilation. Speaking of ventilation, you can throw away the caps of the jugs at this point. (For step-by-step instructions and pictures on making the greenhouses, follow this link to my post about it). Next, fill the bottom of each mini greenhouse with a few inches of potting soil. Wet the soil thoroughly and plant your seeds. Keep the calendar in mind when you plant your seeds. If you're going to be planting tomatoes, for example, you won't want to start your seeds in February if you can't transplant them until May. I started my tomatoes in April, about six or seven weeks before the last frost date in my area. You can plant so many things in these, though, starting in January. For a complete list of what to plant in your mini greenhouses and when, check out this helpful link. Once you've planted your seeds, close the jug and tape it shut. On each jug, write what you've planted in it and the date you planted the seeds. Now, here's the best part: once you've done this, you keep the mini greenhouses outside and leave them alone. No need to bother with artificial lighting and seed trays inside -- you simply leave the milk jug greenhouses outside where they get natural sunlight and the needed moisture from rain and snow through the opening at the top of the jug (that's why you don't keep the cap). Since we had such a dry winter and spring, I did spray the tops of the jugs with the hose when the soil inside looked a little dry. The mini greenhouses require almost no work. The snow can pile up on these things and they'll still grow. In fact, I've read that plants started this way are more hardy because they're exposed to the colder temperatures from the get-go. Not all my seedlings survived transplanting, but a good majority did. So, why am I writing about seed starting, something that is done in late winter and early spring, in the middle of July? Because I have proof that it works! This season, I've got the healthiest, biggest tomato plants I've ever had since I started gardening in my backyard. I've got organic heirloom slicing tomatoes growing, as well as San Marzano paste tomatoes and tomatillos. I've got twelve tomato plants and three tomatillo plants. In years past, I usually spent about $3-5 each for the transplants. Instead, I ordered three packets of organic seeds for about $3 each. If I'd purchased the same amount of tomatoes and tomatillos as transplants this year, I would have spent anywhere from $45-75; with this new seed starting method, I only spent ten bucks. It's enough to make this frugal gardener a little giddy. Yet another reason to love homegrown tomatoes! So, even though this isn't the time of year for seed starting, save this idea for later. Try it in the dreary winter months or the early days of spring. Next summer, you'll be glad you did. I know I am. I can practically taste the homemade salsa already. Heather writes at The Parsimonious Princess, a blog about living frugally in a way that is practical, natural, and simple. She and her husband are the parents of two beautiful little boys and caretakers to one giant cat, two hens, and thousands of Italian honeybees. I was just talking to hubby last night that I wanted a greenhouse to start my plants in next spring. The one I was looking at cost over $500! This is such a neater and cheaper way to grow. Thanks so much for the great idea and tutorial! Ha! I agree with you about the saving money thing. This year for potatoes, I definitely did not even break even. This has also been my first year seed starting and I agree that it saves so much money as well as results in healthier plants. This looks like a great idea! I want to try it, so I'll start saving my jugs. THAT IS AMAZING. Oh wow, no more table-top ironing boards duct-taped to the window frame? Count me in! But I'll definitely raid neighbors' recycling bins for these, since I don't have gallon jugs. What a brilliant idea. I'm definitely starting to do this. Where do you live? Just wondering what climate conditions you're dealing with. Do you poke holes in the tape to allow moisture in? @Anonymous #1: I live in zone 6B. The temperatures get as low as -5 to 0 degrees (F). I usually don't plant tender plants until sometime between Mother's Day and Memorial Day. Our first frost usually happens mid- to late-October. @Erin: You could totally start herbs this way! @Anonymous #2: I don't poke holes in the tape. The key is to leave the cap off the milk jug. The mini-greenhouse gets all the moisture it needs through the opening at the top. Amazing! I have to start RIGHT now though since I live in GA! Luckily I already have a few jugs in the recycling bin- must save them! Thank you so much! This is great! My daughter is doing a science project to see if organic potting mix or reg potting mix grows better plants and veggies. This will totally help with keeping it easy for a couple of 1st graders! Thx! Anonymous comment in caps: once they've gotten established and your outside temps allow them to transplanted, you simply cut the side of the jug and transplant them from there. This is great! This is our first year of having a real garden. We moved to Brainerd, MN last fall and are enduring our first winter. We already have our first batch of seeds, but we have been trying to figure out how to start them. Sure, we can get the little starters, but we have five cats, who are always chomping on our house plants. We may get down to the 20s in March when we start a few things, but this solves the cat and space issues! And...I can keep our milk jugs out of the trash (no local recycling program). Thanks! Thanks for sharing, it is a great idea. I thought I was the only one who felt that way about starting seeds from scratch. Each year I learn a bit more about gardening in the high mountain ranges (over 6300 ft above sea level) with winters as low as 31 degrees below zero. We have winds that dry the ground and the plants with in hours. The sun scalds plant leaves so we construct canopies to shade them. Well, to say the least, it is a constant challenge. Each year I learn a new way to succeed. I am excited to try the jugs. Thank you so much for the info! My husband and I are starting our first vegetable garden this year. How many seeds can be placed in each gallon jug??? Thanks again, I'm so excited, I've messaged all of my neighbors to save their jugs for me! Do you think the plastic leaches? I'm getting ready to try this with tomato seeds. How many seeds do I put in each jug. As for how many seeds to plant and spacing, I just followed the planting directions on the packet of seeds. I just checked the packet for the tomato seeds I planted last year and it read: "seeds can be sown thick in one cell and then planted into individual cells after true leaves appear." If my memory serves me right, I believe I just scattered some seeds in there, covered them up, and then as they started to sprout, I thinned it out and kept the strongest ones (think of those seed starting trays at the store and you could space out the stronger starts accordingly -- they don't need much space). I hope that's helpful -- sorry if it isn't. I have wanted a greenhouse (and a personal library) all my life! Would this milk jug greenhouse work in Manitoba Canada? Most years we have lots of snow and the temperature can his -40 without the windchill. Does it matter how "winterized" the greenhouses get? Every year I get SO excited about my garden! I tried this in Saskatchewan Zone 2, last year without much success. Soil just dried up. I think I started too early, going to try again around the first of march. Have you tried cloning your tomatoe plants and others as well? I do that with my garden and it also saves a lot of money! 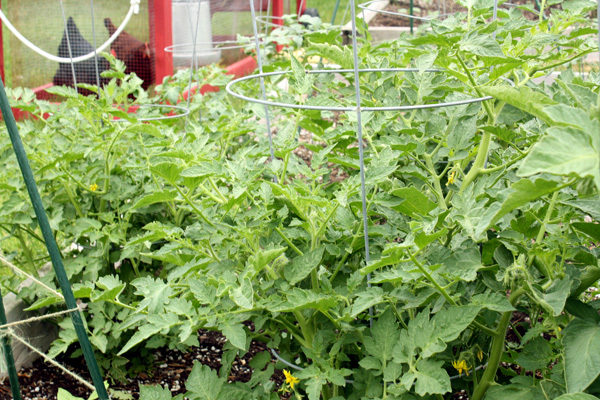 Tomatoes are particularly easy, but any plant with a hard stem you can clone. Tree, bush, flower... Anything! I love it. You can go to pretty much any plant store and ask a worker about it. Biggest problem... People are going to think its for pot, but no worries everyone knows there are people who clone other things as well haha. You can't get in any trouble or frowned apon, its a pretty common buy. My favorite is Clonex($25-$30). It has special nutrients and such already added in. Its a little pricey but cheaper ones have less. With cloning agents, you really are paying for what you get. And the rockwool you put it in, is fairly cheap too($3-$7 for a package of like30). In the end you are saving quite abit. Especially if you come up with your own breeds of plants which I have also started doing as well. Its fun and your jugs are just perfect for cloning!!! Good luck & happy gardening!!! Thanks for the information. I am new to gardening. I have a question, though. Is there a difference between regular seeds and organic seeds? If so, please explain. Would this work for marigolds, begonias, petunias, and other annuals? I plant about 14 flats of annuals every spring and every year it costs more and more. I live in Michigan. What kind of seed can we start with in January, Canada ? All depends what area of Canada. Vancouver is VERY different from say, Winnipeg. Can the jugs be clear? I have lots of gallon clear water bottles, can I use them? Or should they be the foggy type like the milk jugs? I tried your gallon jug method to start my tomato seeds this spring. I officially have a new project for Feb. I saw the comment for Wintersown. Wintersown even offers free seeds and encourages sharing seeds back with them. I just started a bunch of seeds in my basement, but definitely I want to try a few this way. My worry is that since I am in misery (Missouri), the weather is so back and forth. We are likely to have 80 degree days which would be too hot and then -5 a few days later. I have been using plastic milk bottles with the base of each bottle removed. I mostly use them as mini-glasshouses that I place over my seedlings in early spring when it is still cool. During the day if it gets too warm, I remove the lids so that they don't get too hot. They are also great for protecting young succulent seedlings from slugs and snails at night. I would like to plant my mahgony seeds in these cans. But ilI dont know what season they should be planted? I am storing it now in the refregierator. I live in Wyoming, a mile high and I am always wanting to start my flower seeds in the house but don't have room, I worry that between the cold and the extreme winds we get that they won't come up. In wyoming or windy places if you start plants indoors put a fan on low periodically and it makes the plants stronger. What's in YOUR Herb Garden? In My Garden - Wordless Wednesday with Linky!